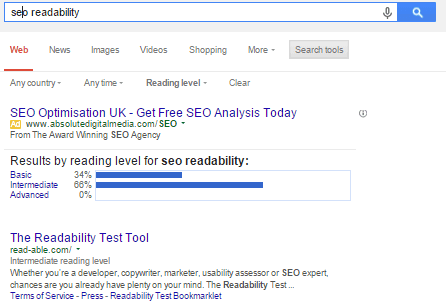 Will Yoast’s Readability Score Make or Break my SEO? Understand passive voice and improve your SEO. It’s interesting that Yoast’s SEO plugin has expanded into readability. While it’s thought of as a direct readability factor, last year I did a small study which indicated that readability is a lot more complex than the Flesch-Kincaid readability test. You want your visitors to understand what you write, but beyond that is there really just one way to be user friendly and reap the ranking benefits? Google has a little known function – you can search by estimated readability level, beginner, intermediate and advanced. My study looked at the first few results of searches aimed at different age groups and concluded that the common wisdom of the time, that easy readability would directly help your search ranking is flawed. Easy readability isn’t always best for SEO – click on Google’s search tools and play about yourself. Google doesn’t take readability into account directly as a ranking factor, but the indirect gains from writing for your audience supersede the negativity theorised by Yoast. It may sound obvious but you would be amazed how many SEOs dumb down their clients pages because they consider simple wording to be better. This idea is now being reinforced by a hugely popular plugin which many bloggers have used for years to guide their SEO practices, problem is easy readability is not always what your audience will want. Let me be clear, ideally anybody who might want to read your content should be able to read your content. That doesn’t mean that you should write in a way that isn’t natural to you in order to score plugin points, specially if you feel there is even a small loss to the feel of your work. If you can’t explain it simply you don’t understand it well enough BUT simple doesn’t always mean short sentences void of jargon. Jargon gets a bad rep, but take a quick look at the word’s origins. Jargon is industry specific slang. Who are your audience – are they beginners who need to be slowly spoon fed jargon so that they understand more advanced blogs, or are they nerds who will appreciate correct use of language? A lot of jargon – again like slang – has a story behind it; try and get the origin of the word into the explanation, it may be a funny story. I use Yoast’s SEO plugin and would advise it to anybody who uses WordPress as the best SEO plugin. You may have guessed that I am not a fan of Yoast’s readability update. I have deliberately written this text to get a bad readability score from Yoast, however hopefully nobody will have any problem with understanding what I write. In the next few sections I will aim to be more impartial than this introduction. Some of the suggestions Yoast gives are perfectly valid in most situations – but not all situations. The readability score is only a guide, Yoast is not using AI to get the context of your pages (Google does). Like getting a green light for SEO doesn’t mean your page will rank well in Google, a green light for readability doesn’t mean your text is well written. Should you pay attention to Yoast’s readability score? My Score from Yoast – I barely passed the Flesch Reading ease test by (0.3%). Overall this page scored as needing improvement. Initially I failed the Flesch’s readability test by getting a score of 59.7. By their analysis this should be readable by an average 13 year old but that is not considered good enough to be greenlighted by Yoast. After tweaking this post my score happened to improve by 0.6% – practically nothing but the difference between a pass and a fail. Now my readability score is down to 59.4. More on that coming up. Subheadings are highlighted both in Yoast’s readability, and SEO scores. Subheadings are a good way of dividing up your text for ease of understanding and navigation. Google are also likely pay more attention to keywords in your subheadings than in your regular text. It is hard to find any fault with Yoast suggesting you use at least some subheadings. The only (small) problem on the readability side is that Yoast advises you keep less than 300 words between your subheadings. This post has a very long introduction. It may have been easier to read split into subheadings, but at the same time adding subheadings before this section felt forced and I personally feel they would have lowered the overall quality of this article. There are also alternatives. Bullet points, images, bold, italics and quotes all divide up your text into easy to read sections similar to subheadings. Varied textual characteristics improve the amount of time a reader spends on your pages, so presumably also aid readability. Even so subheadings are the only readability metric that Yoast uses which I can confidently say will help your SEO. Having an SEO plugin advise you to use subheadings is definitely a good idea for absolute beginners. 1 point to Mr Yoast. The Flesch Kincaid readability test attempts to mathematically identify the average age that a person will be able to understand your text. Yoast advises that your text should be readable by anybody above 8th grade (US) level – approximately 12-13. There’s two real problems with this. Firstly not all text should be readable by your average 12 year old, Google seem aware of that fact and don’t always rank easy readable pages first. Secondly the readability test uses the ratio of syllables to words, and words to sentences to give a score from 1-100. Should this particular test be used by an SEO plugin? Overall it sounds like a good idea, however scores of 0-30 are classified as “best understood by university graduates” and 30-50 points is college level. That’s not a negative for a text written targeting university graduates or students; scientific papers often score low on this readability test. My (correct) use of a semicolon in the previous sentence will automatically give me a slightly lower Flesch-Kincaid readability score than if I used a full stop. Tools designed to improve readability and flow turn into negatives when you are aiming for basic readability. Take the following comma, I could have added an extra full stop but then I would be writing for the readability test rather than the end user. I may be being pedantic here, but the Flesch Kincaid readability test doesn’t correlate with SEO rankings. It also isn’t a great estimator of readability, and use of complex sentences (sentences which use transition words) is seen as positive and negative at the same time. In the name of fairness I have to point out that Yoast advises a sentence length of 20 words. This doesn’t take into account the amount of syllables in a word or sentence length like the Flesch Kincaid test does. 20 word sentences are easily long enough to be complex, if not compound. It is sometimes difficult to understand the subject of a long compound sentence, but that doesn’t mean that they are inherently bad. Long and complex sentences should be perfectly understandable as long as they are truly complex sentences: not compound sentences missing a comma, two sentences missing a full stop, or a grey area inbetween missing a semicolon. The reason that I object to these particular three readability scorings is that used together it is very hard to get a perfect score. If you didn’t know that none of these scores are likely to have any direct effect on SEO at all, you could drive yourself mad trying to write a perfect scoring webpage which sacrifices actual readability. I have deliberately used a lot of complex and long sentences to show that it’s possible to keep good readability. I think the main obstacle to a young teen reading this text is the use of jargon. Jargon is not a negative if you are writing for a specific audience. There will be very few – if any – people in their early teens who know, or care about SEO. In most online communities correct use of technical wording is very important. It is better to link to a glossary explaining jargon than using incorrect language to get a green light on a plugin. Fair game Yoast. Generally repeating the first word of a sentence is bad. One suggestion – highlight where this has been done. The only post (other than this one) where I have found myself getting called out by Yoast for repetition is over 9000 words long. I can’t find which sentences the damn plugin is referring too. It’s lazy but I’m being sloppy – I don’t want to search for a needle in a haystack. It’s sloppy but repetition adds emphasis so there are cases where it’s a perfectly valid tool. It’s sloppy and over the top – not the best example – but I hope this paragraph highlights that sometimes repetition is acceptable. Advanced linguistics follow which can be simplified to one sentence. Write for your demographic as compellingly as you can! If you would like to learn more about passive voice’s lack of effect on readability or SEO, if you are curious about how to write more compellingly, or if you want to see Yoast SEO’s biggest readability mistake read on. Alternatively please skip to the next section which answers why SEO friendly content isn’t the same as easy to read content? Bear with me because there’s no easy way of explaining my gripe – you will either understand passive voice and it’s uses or you won’t. You don’t have to understand the following section to see how bad Yoast’s passive voice analysis is. Reading it is fairly self explanatory until I paraphrase Wikipedia. Passive voice is an advanced grammatical construct which isn’t hugely relevant to SEO or writing – everyone has their own style and preference. Why does Yoast criticise for using it? The passive voice can be inexact and grammatically inferior – it is considered impersonal and impolite while the active voice is considered formal and correct. Understanding the active voice can make your writing more compelling, however like all grammatical rules there are exceptions. A lot of SEOs use passive voice to build a friendlier relationship with their audience. What is passive voice? An example of Yoast’s biggest mistake! I really tried to make this very complex subject as easy to understand as possible by using a relevant example. Please give me feedback to help future readers in the comments at the bottom. Wikipedia does a good job of explaining grammatical voice in their introduction. You’ll see my biggest issue with Yoast including readability in his SEO plugin as I explore passive voice in the SEO context. When you are using active voice, the subject who has initialised an event [bolded in the following two examples] is mentioned before the target of said event [italicised]. Passive voice is the reverse (explained in more depth later on). The biggest complaint I have about Yoast’s analysis of the passive voice is that there’s situations where the plugin makes mistakes. This includes the last two examples above. ‘SEO’ can be a verb or a noun – you can perform SEO on your website, or your job title could be an SEO. That confuses the plugin. I take issue that a confused algorithm sets rules in stones for a grammatical technique which has wide and varied applications. While Yoast doesn’t deny that using passive voice can be valid the plugin certainly implies that it isn’t. Source – Wikipedia: Passive Voice – heavily paraphrased for readability. Agent and patient don’t imply personhood, and this is getting into unnecessarily advanced linguistics. What this does further reinforce is that using passive voice for readability is sometimes actively good, so using passive voice for SEO also won’t hurt you. Passive voice is not merely not bad – it is often the correct voice to use. Should SEO Friendly Text Be Easy To Read? I am writing about readability’s relevance to SEO because I want to rank for the keyword readability. Repeating the word readability doesn’t help readability, but may improve my search rankings. Google has come a long way in the last couple of years but there are still people who swear by keyword density. Although the above quote is not logically written, doesn’t have great readability and practically won’t help my search rankings, Yoast would find no problem with the quote from a readability point of view. The quote contains short sentences. The second sentence contains a transition word. The two sentences start with different words. The quote has correct use of grammar. The quote has ~9% keyword density, which is high but Yoast doesn’t use keyword density as a readability metric. The second half is written in a passive voice. Only one error by Yoast’s scoring, but that quote is neither SEO friendly nor easily readable – certainly nobody would call it well written. I define SEO friendly content as a text which is keyword rich (not stuffed like the quote above) clearly targeted for it’s audience and using the correct technical terms for the subject matter. The more advanced your target demographic the more complex your writing should be. I made the point earlier that a 12 year old is unlikely to understand SEO or even readability maybe. If I write case studies simple enough for a 12 year old to understand I am damaging my core audience of technophiles who appreciate the correct use of advanced language. Personally I think overuse of keywords is one of the worst things that SEOs can do to their readability. Google takes semantics into account so if I am writing about readability and SEO, Google would probably expect me to also talk about keywords as the three subjects are linked. Keyword rich text doesn’t overuse the same keyword. The real skill behind SEO friendly writing is identifying what your audience is and what level and style of writing they will appreciate. If you can maximise your keyword usage without it being noticeable to the reader that is a bonus. A lot of you are finding me on Google by searching does readability affect SEO. The answer has to be a solid yes, but maybe not how you would expect. SEOs advise short paragraphs as I discussed earlier. This is not because Google likes short paragraphs, this is because your readership might like short paragraphs. If they don’t your SEO won’t benefit from simplistic readability. Good grammar and spelling is important. These are likely to be direct readability linked SEO ranking metrics. It gets more complex when you start looking at word length and complexity. The indirect ranking gains you will get by writing for your audience are far more important than any possible direct effect simple readability may have on your SEO in Google’s algorithm. Learn what your audience want and then learn how you can give it to them. Really, really focus on your page title and description. Getting the right level of readability on the search results page will improve your click through rate and that can massively help your SEO – albeit indirectly. I wrote this post before Yoast SEO released an update allowing their readability guidelines to be switched off. You can find this in their settings under features. A standard blogger who installs Yoast on their website and then runs their setup wizard doesn’t get this option, and it is not immediately obvious to users who already have Yoast SEO installed. Good software should be intuitive so I feel that this post is still just as relevant as when it was first written. By default the most popular SEO plugin (which in many other ways is excellent), for one of the internet’s most popular blogging platforms has a fundamental flaw. It implies that there is a correct way writing for any audience using a traffic lights system and allowing very little flexibility. If you know what you are doing the readability indicator may help, but if you know what you are doing you will be conscious of your own readability and writing style. Readability has a huge effect on user experience which in turn has a knock on effect on SEO. I don’t object to having the data but Yoast massively oversimplifies readability on some fairly complex rules. I can’t help but laugh when I see a guide written with the goal of getting a poor readability score from Yoast by breaking some ‘best practices’ getting comparatively good search traffic, and often beating Yoast for readability related keywords usually scoring in the top three for ‘yoasts readability’. The objection I have is that Yoast’s SEO plugin is the widest used WordPress SEO plugin. Does it have some great features? Yes. Overall it also serves it purpose very well. Where it falls down is the implication that Yoast’s readability metrics help your SEO, that’s simply untrue. If you want to improve engagement, readability and time spent on page read my engageability and user experience guide. It gives easy to implement user focussed advice rather than algorithmic rules. This is an area that is always not easy to master. Every single article written most of times needs improvement even when the paragraphs, sentences and grammar has been written to cater to Yoast requirements. Appreciate you sharing this article and shedding some light on this subject. Thanks for the comment Reinaldo, just updated security and have been avoiding logging in so my apologies for the late acceptance. Readability is subjective and I really believe that Google cater to this. As Yoast is an SEO plugin I feel that they shouldn’t be giving flawed readability advice. I usually get the green light on readability in the beginning before throwing in tables and charts. I like to use tag instead of relying on plugin like Tablepress, as I can then be flexible with the style. So once I did that it’s down to “Needs improvement”. Can’t they provide an option to ignore tables and charts? Anyway, we have been through the days when yoast plugin don’t have the readability tab and we were doing good. Still doing fine with ranking even the light is red. So don’t bother. I managed to get approval for Yoast’s affiliate program based on this blog (no there aren’t any affiliate links and when they are they won’t be cloaked). The lady approving me took my criticism on board and accepted that specially when it comes to sentence structure and readability it can be confusing. Obviously Yoast’s readability score is more a guide than a rule, but it’s included as a defult with with their SEO plugin. I think I always greenlight for SEO. The problem is very beginners don’t realise that there’s no such thing as ‘SEO friendly text’. Only audience friendly text – hence I get a lot of traffic from “yoast readability needs improvement” and “does readability affect SEO”. I find exactly the same Martin. Everything starts off as a green light on readability but the light changes, seemingly arbitrarily, to red (not orange to red…straight to red!) very often after I’ve added a gallery. I really cannot understand how this throws everything out of whack. Usually the Flesch test is what suffers the most when ‘the light changes’ so to speak. This functionality seems deeply flawed. It just happened on another post and I pasted the text into Word to check the readability there. On Yoast, the Flesch readability is scored at 39.9 but on Word it’s scoring at 64.5. The changes that I’d need to make to get the Yoast Green Light make the text of my blog-post cumbersome and, frankly, dumbs-down the content. It feels wrong to publish the content when it has a Readability Red Light but I’m getting really fed up with this Yoast ‘feature’! Thank you David for this article (which made me laugh) and for at least confirming that I’m not the only one suffering at the hands of Yoast’s random readability measure. I like ‘It feels wrong to publish the content when it has a Readability Red Light’ which is the essence of the article. The feature can be turned off but that would only make sense to do if you know the flaws of the feature and that there’s no real benefit to your SEO. I made a point (now revised) on a blog relating to how to monitise a forum about the mad lengths people will go a electronic coloured light (forum reputation in that case). I’ll take a look at the differences between Yoast and Microsoft Word’s Flesch readability scorings thanks for bringing that to light Alisa :). Thank you for adding this Mark – I have meaning to update this whole website but have been really busy on other projects. The guide is targeted at people who know very little about SEO – I fair amount of traffic from phrases similar to does readability affect SEO as well as Yoast readability – so I really should be telling people how to turn the thing off. I’ll get that added later today. There’s really no need trying to disable the readability from my own point of view. Best is to ignore it when you are sure of what you are doing. There’s a part that will interest you. The part that gives limit to how maximum number of words you should have before having heading (or sub-heading). This feature will boost your SEO since search engines love heading. Lastly, it’s up to you to decide to turn it off or not. Yeah SEO is all about finding what works for you – in your niche if you find the readability, or bits of the readability scorings are a help that’s good. They have uses, but you need to be aware Yoast released the feature way before it was ready, and I am unsure if it ever truly will be the catch all readability plugin he wants. This is what I am looking for for the last 3 hours and I read every single word and very appreciated the way you are written. I am now very much clearer regarding the Yoast readability. Really can’t thank you enough for sharing this article. I thought my writing was the worst until I landed on your post comment section. It’s a much relief experience. I was worried that the post would become less relevant as people disabled the feature and time goes on. Problem is it’s still not obvious that you can turn off the readability aspect of his plugin, or that you should so my analytics haven’t drastically dropped. Great article, thank you so much! Glad you liked it – did you find me through Google or social? If you need any quick tips on specific readability wordpress, or SEO related subjects drop me a message. The fact that this post ranks #1 for “does readability affect SEO” speaks volumes. Apologies this comes so late – many thanks for the great feedback. This post was a kind of small case study and it did its job better than I had hoped it would. I know this is an older post, but I was wondering what your thoughts were on in-post widgets that interfere with Yoast’s “readability” score. I added a few shop widgets to posts in my home decor blog, and as soon as I hit update on WordPress, my readability score tanked. It seems as if Yoast is reading the backend code for this widget and scoring it as if it were copy. I now have low scores for the consecutive sentences score since my widget code obviously starts with the same words. My score on the Flesch Reading Ease also dropped 50 points with the added widgets. Any ideas if this is something that will actually affect my SEO? I hate to replace the widget, as it is better visually than any other shortcode or widget that I have tried. Thank you Lauren – this wasn’t something I had even considered. I can assure you your score won’t affect anything SEO related. Bad or un-seo friendly writing will. I’ll run some tests. Yoast does admit that certain parts of the app are broken, mainly round passive voice however I think personally the team moved into a territory which looks good on paper but just isn’t practical. I love it when people can diy their marketing themselves so I offer an hours free consultation to everybody. It sounds like you know what you know what you are doing and I am not after you as a customer, you just peeked my interest. I try and simplify a few aspects of advanced SEO/psychological marketing. I’ll extend the hours consultation and alo give a short audit/write up for free too if your theory is correct. Let me know -if nothing else I specialise in engagement (hence why I no longer load fastest tools.pingdom.com ever recorded) and know some really useful plugins. A great post in deep about yoast readability score.Thank you so much.Helped me a lot to understand every concepts.Thanks for the amazing post. Yeah it was so relevant at the time and they still haven’t exactly explained everything as they should. Bottom line, readability is more than 50% of user experience. Explain what you are encouraging people who have gone for the simplest optimisation tool available. And the passive voice is such an archaic idea. At least it has an off button now. Hi David, I read your blog with interest, because I am an editor on a website and we use Yoast, but the readability part can annoy me too for the same reasons as you outlined (although we don’t go for the green light if it would detract from the writing). Is there another SEO plugin for WordPress that you can recommend? It sounds like you essentially understand the problem well. There are few workarounds I can think of – if you want to stay with Yoast understand what all the readability factors mean, then you can use the plugin as a guide with your own demographic in mind (rather than a colour chart). The false negatives are still an issue with this fix though. Alternatively you can turn the readability setting off (you couldn’t at the time of writing). Look under General settings>Features. It’s worth doing if you are working on other people’s websites because red light’s and ‘needs improvement’ just looks bad and it is hard to explain that it isn’t negatively affecting your SEO when your SEO plugin says it is. That is my real gripe with Yoast – they really should have made two separate plugins and they would have seen how unpopular the readability feature is. Finally ‘All In One SEO’ is considered to be the main competitor to Yoast and has very similar features and easy/intuitive usability from the get go, however they don’t go for colour chart simplification like YoastSEO. Please could you let me know what you decide on and why? it might help somebody else in your situation decide in the future. I loved this post and it looks like it answers my question. I was stuck with Passive voice sentences, since my article is related to SEO, it keeps showing that a red light. I am going to post it as is, I don’t care about the green lights anymore. Thanks Shehryaz that’s exactly what I like to hear about my posts. I have other case studies and look at marketing from a different angle than the traditional. You might want to consider reading if you are a SEO/general marketer yourself. Sometimes adding just one small image to a post can change the readabilty score from orange to green. I’ll look into why exactly that is – sometimes the app seems to have a mind of its own. Maybe it considers images, or various code (alt tags for example) as text. Thank you for bringing that to my attention John. Hi John. I have played around with the alt text – that makes no difference to readability scoring. What might make a difference is if you use captions. It would make sense as captions are text that appear in your post so affect the user’s understanding, but are part of an image. I think it is correct that they affect readability, so really I think this is a point for Yoast. After years of Yoast’s updates this post is still ranked in the top three of Google, but the readability apparently gets a red light. It is still very much flawed.